- Publisher We know that Scripture is practical, relevant, and applicable. But often our best attempts to apply the Bible fall short, or even mishandle God's Word. Daniel M. Doriani provides seasoned, wise, and immensely practical direction, of use to pastors, teachers, counselors -- anyone who wants to put biblical truth to work. 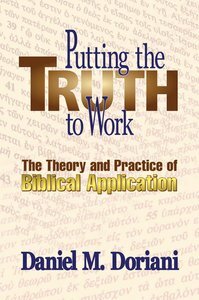 About "Putting the Truth to Work"
We know that Scripture is practical, relevant, and applicable. But often our best attempts to apply the Bible fall short, or even mishandle God's Word. Daniel M. Doriani provides seasoned, wise, and immensely practical direction, of use to pastors, teachers, counselors -- anyone who wants to put biblical truth to work. Daniel M. Doriani (Ph.D., Westminster Theological Seminary) is senior pastor of Central Presbyterian Church, Clayton, Missouri. He previously was dean of faculty and professor of New Testament at Covenant Theological Seminary. He si the author of Matthew (2 vols) and James (Reformed Expository Commentary), Women and Ministry: What the Bible Teaches and Putting the Truth to Work: The Theory and Practice of Biblical Application.